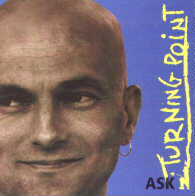 "Turning Point" is the second album from Ole Ask, and builds on the solid foundations of his eponymous first album. Norwegian born--although you would not know it just by listening--Ask, who sings and plays acoustic guitars throughout, is aided and abetted by a host of friends from the Twin Cities. Ask also wrote all of the songs here, which deal with the ins and outs of every day life. The album's opener ("Someone Like You") is a fairly typical example of Ask's work on the rest of the album. It reminds me of Chris Rea, a feeling that is reinforced by Ask's rasping vocals which are a combination of Rea, Tom Waits, and Bruce Springsteen. Musically, much of Ask's tunes also reflect the same set of influences. The traces of Waits are particularly evident on songs such as the lounge jazz of "If I Was Your Dog," which includes some wry humor in the twist at the end of the song. Ask seems quite prepared to tackle just about any musical style you care to name. The prime example of this is the almost surreal "House of Peace." It features some very fine fiddle playing by Jim Price, on a tune in which the verses are played out to a lilting reggae beat. By way of variation, the chorus shifts the beat into a more jazzy tempo. It all hangs together rather well, too. The style of "Turning Point" is definitely not straight blues, and rests more comfortably in AOR territory. Having said that, there is a blues inflection to some of the songs, and Ask shows that he can turn his hand to the blues when he so desires. The bluesiest tune here is the closing "Love You Written On A Wall" which sees Ask playing in a down home delta style on dobro, suitably encouraged by Tom Burns' wailing harp. "Turning Point" should help to further establish Ole Ask's reputation as a good singer/songwriter. If you are looking for blues, however, you will not find much of it here. Nonetheless, it is a good album, so if you are looking for something a bit more in the rock mainstream, this is not a bad place to turn.